Although he only spent 42 years on Earth, Dennis Emmanuel Brown left us a catalogue of classics that have shaped reggae music like few other artists. He recorded two albums, his debut album No Man Is An Island and If I Follow My Heart, in just two days – at the tender age of twelve. No wonder that in the 30 years of his career, he recorded almost 80 albums. His untimely death ended a highly productive career. The Crown Prince of Reggae ranks, alongside Bob Marley, Peter Tosh and Gregory Isaacs, as one of the most covered reggae artists of all times. Bob Marley named him as his favourite singer. VP Records now pays tribute to him with a collection of 30 of his songs on two CDs, sung mostly by young Jamaican talents well on their way to establishing themselves, and a few legends like Freddie McGregor, Maxi Priest, Mutabaruka and Mykal Rose. Many of the participating singers have worked with Dennis Brown, or feel that he was an important influence on their own sound. The first CD gathers songs that fall in the category of social commentary, the second is dedicated to lover’s rock. Although super hits like Money in My Pocket naturally found their way into this collection, the selection of songs isn’t too obvious overall, keeping things interesting. The concept behind We Remember Dennis Brown is the same VP used for Our Favorite Beres Hammond Songs and We Remember Gregory Isaacs: respected singers choose their favourite song of the artist in question and record their own version of it. Each artist adds their own touch to their interpretation, but the original character of the song tends to still shine through. Clive Hunt, who produced Dennis Brown’s 1981 album Foul Play and worked with him regularly and extensively, produced this major effort with an all-star band of musicians and meticulous attention to detail. The musicians featured include, but are not limited to: Kirk Bennett, Lamont “Monty” Savory, Aeion Hoilett, Carol “Bowie” McLauglin, Franklin “Bubbla” Waul, Tyrone Downie, “Bongo” Herman, Daniel “Axe Man” Thompson, Dean Fraser, and “Nambo” Robinson. The first track, I Need Your Love (Rasta Children), features Iba Mahr, Jesse Royal, Chronixx, Keznamdi, Exco Levi, Kelissa, Jahmiel, Kabaka Pyramid and Rockaz Elements on vocals – now that’s what you call a combination. It’s a musical relay race, so to speak. The last track of each CD, respectively To the Foundation and Silhouette, are instrumental versions. The compilation is entirely void of fillers, but quite a few artists stand out and really kill it. Bushman is one of them, he tries and excels at the somewhat unwieldy Don’t Want to be No General. Raging Fyah tackle Milk and Honey. Christopher Ellis reinterprets Created By the Father beautifully. Dennis’ daughter Marla Brown teamed up with Mutabaruka for a stunning rendition of Words of Wisdom. Freddie McGregor delights with Little Village, as does Shuga with Liberation. 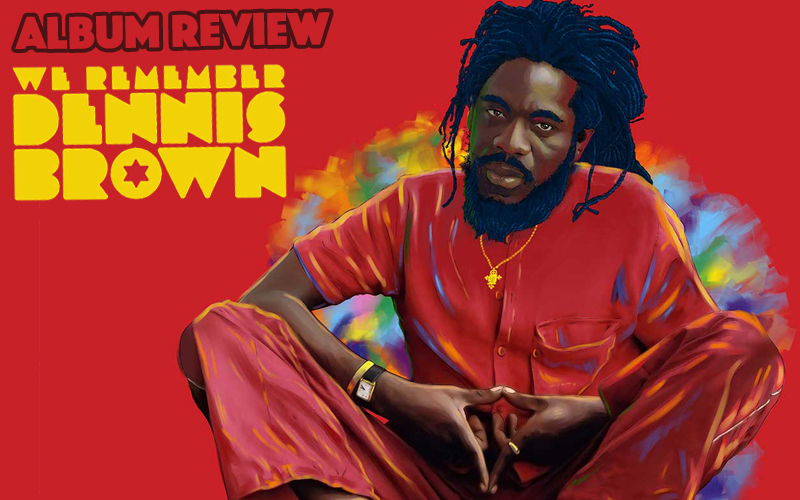 The lover’s rock part of We Remember Dennis Brown shines brightest with British R&B singer Marsha Ambrosius taking on Have You Ever, and Maxi Priest sugar-coating Love Me Always. Jamelody and Ikaya croon Love Has Found Its Way at the perfect temperature. Ikaya also sings For You. Furthermore, Katchafire, Etana, Jah Cure and Dalton Harris deserve a special mention. While We Remember Dennis Brown is available on iTunes, of course, buyers of the physical edition will be rewarded with deluxe packaging and extensive liner notes. Whatever edition you might prefer, this extensive collection of newly interpreted classics is a masterpiece that deserves to be a part of the collection of every serious reggae lover. It reminds us once more of just what a terrible loss Dennis Brown’s untimely death meant for the reggae world. His music lives on though, and the singers united here prove that they are a part of his legacy, to a surprising extent. And his songs sound just as catchy, fresh and up-to-date today as ever.